A new research from apartment search website RENTCafé shows that the rental market is proving to be quite a challenge for many Millennial renters. Based on the U.S. Census total median income and total rent paid between the ages of 22 and 30, Millennials spend about $92,600 on rent during this 8-year period. Additionally, they are also the most rent burdened generation, spending 45% of their income on rent before hitting 30. To put it into perspective, Generation X renters witnessed a rent burden of 41% and Baby Boomers spent about 36% of their income on rent when they were at that age. It’s worth mentioning that Millennials have a higher income than Generation Xers and Baby Boomers did in their 20s. Between the ages of 22 and 30, Millennials earned a total median amount of $206,600, and $92,600 of that went solely on rent. Compared to Gen Xers, Millennials earned $4,500 more but at the same time paid $10,400 more on rent. The difference is even more striking when we look at Baby Boomers versus Millennials. 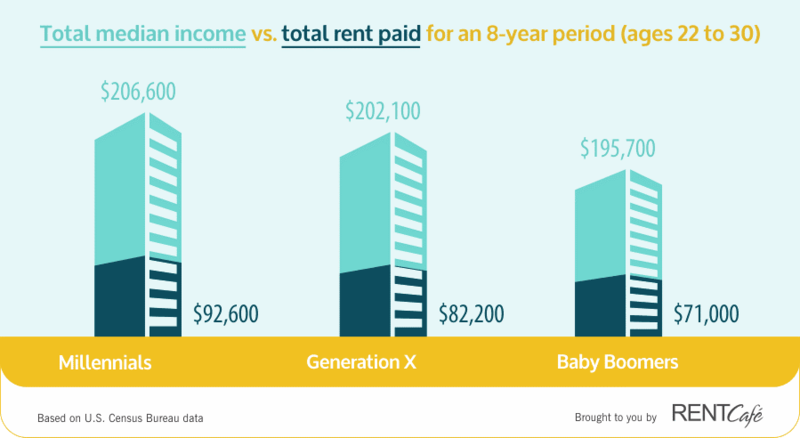 The Millennial generation earned $10,900 more than their Baby Boomer parents, but paid $21,600 more on rent. This means that Gen Xers and Baby Boomers earned less than Millennials, but they were not as financially challenged since both generations paid less on rent. The study also shows that younger Millennials have it even rougher than older Millennials in terms of rent burden. While younger Millennials (now aged 22 to 29) paid $97,400 on rent before turning 30, older Millennials (now aged 30 to 40) paid a median rent of $90,500. This translates in a rent burden of 47% for younger Millennials and 44% for older Millennials. The income is higher for younger Millennials who earn a total median amount of $207,200 while their older counterparts earn about $203,800 during the same eight-year period. Given the increasing student loan debt, high rents and spending habits, Millennials’ financial struggle is best reflected in their postponement of buying a home. There are some bad news for Generation Z renters as well. If rents continue to go up at this pace, they are expected to pay a total rent of $102,100 by the time they turn 30. If we also think about future apartment technology updates and how they will impact rent prices, we might have an even gloomier picture.